The Red Canyon is just north of Bryce Canyon. 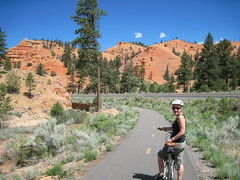 There is a nice paved bike trail that winds up the canyon. We started our day off with an hour bike ride. We then pointed the Sienna towards Moab. On the way, we had some scenic surprises. Highway 12 from Bryce to Torrey has got to be one of the most scenic highways in the country. Much of it is in the Grand Staircase Escalante National Monument. From red rock canyons to rolling hills of aspen groves; from grand vistas to Anasazi ruins, this highway covers it all, with very little traffic. We also stopped in Capital Reef National Park. This lesser known NP has a lot to offer, but is much less developed than its neighbors. We took the time to take a hike up the Grand Wash to the narrows. It was a little on the warm side because the elevation is lower, but we enjoyed the shade and breezes of the canyon. We made it to Moab on the late side, and unlike our usual habit, checked in to a Motel 6. Guess who came for a visit?